My QB wings have about 1/8" gap between the skin and the bottom edge of the long threaded block that the tie tie down ring screw into. If I don't deal with it, the skin will deform (probably not permanently) when I tighten a lock nut. I would like to get something in there to bridge the gap. I am thinking JB weld or epoxy and have some ideas on doing it without it getting into the threads. However, I am curious if someone in the group has come up with a good idea for dealing with this. The trick I used for my 7 is to screw in a set screw to limit the depth of penetration of the tiedown ring shaft. This way, you can get the tiedown ring flang (if you have one) right up against the skin. Use a dremel to enlarge the hole in the skin. You'll get a structurally better connection that way and won't deform the skin. Put a sleeve on the tiedown so that it acts as a stop. Another simple way is to use JB weld on a few threads next to the ring. If doing a slow build wing move the tie down block lower so it is flush on the inside of the wing. Add a rubber washer on the tiedown ring to protect the paint. I added a rubber grommet to the base of the tie down ring on my 9. Seems to work fine. I did what Kyle said. Enlarged the hole. If the wing is still open, replace the brackets and install them so they are flush. That's what I did. Cleveland sells a kit with three brackets and rings. Brackets are pre-tapped. For my tail tie-down I found a nylon shouldered washer/spacer in the hardware store that I wedged/popped between the inside of the skin and the bracket. I think I had to file the nylon a little and adjust the skin hole size. If it were me, I'd do the same trick, but with an aluminum 'shim'. 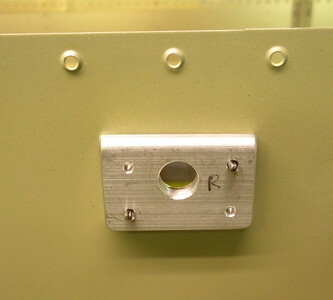 Cut to fit, drill slightly oversize hole, slide into place, screw in the tiedown, and proseal or RTV around the edges to the skin and between the shim and the anchor extrusion. This shim was riveted onto the skin before she skin was riveted to the spar. However, I think that skin is already riveted on the QB wings, so another method of getting the spacer in there would be needed.